Will it not be marvelous if the Muhammadu Buhari-led government of Nigeria declares a state of emergency in Anambra state simply because the people decided not to participate in the November 18 governorship poll? The shallow-minded act if declared shall surely bring forth more attention towards the struggle for the restoration of the sovereign state of Biafra. It will loudly announce the choice of the people and the readiness to have an independent nation. I am not propagating for an emergency rule neither am I going to kick against it because most parts of Biafra land is already heavily militarized as if there is a warfare going on, so why should I be worried over the imposition of emergency rule? But as a journalist, I am compelled to enlighten my readers as I have always done in my column. 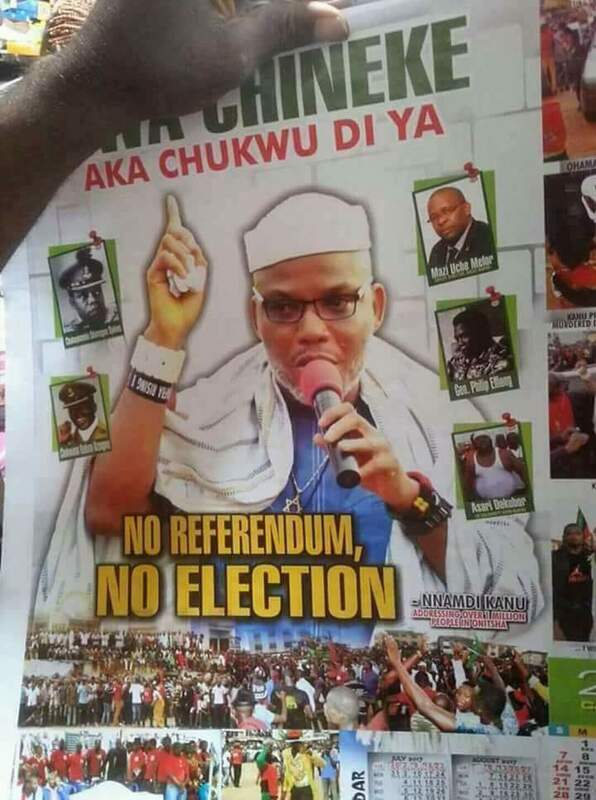 The Indigenous people of Biafra, IPOB, led by Mazi Nnamdi Kanu have chosen to boycott every election organized by the Nigeria government in Biafra land until a referendum is held so as to allow the indigenous people make their choice for a united Nigeria or an Independent nation of Biafra. The boycott of elections in Biafra land is a form of protest and civil disobedience to draw attention to the desire of the people and must not be taken for granted. 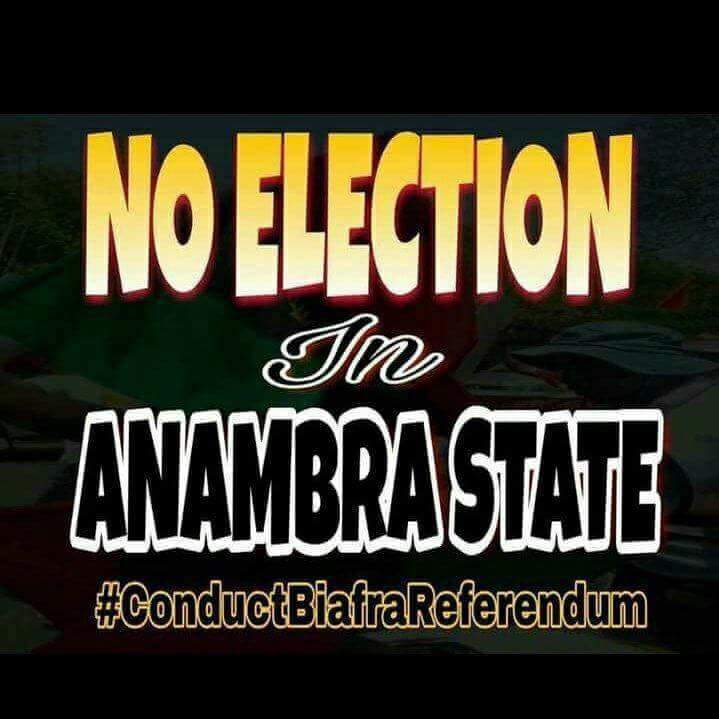 Knowing the resolve of the people to boycott the Anambra sate governorship election, the politicians began to propagate the falsehood that a state of emergency rule will be enforced by the Nigeria president if the citizens do not participate in the election. I call it a falsehood because it is not legal but knowing the antecedent of the present administration for unlawful acts, it may be the only option to force the All Progressive Party (APC) into ruling the state. Constitutionally, two-third of votes are needed to declare a candidate the governor of any state in Nigeria and in a situation that is not met, the Speaker of the state’s House of Assembly is supposed to take over in an acting capacity until the requirement is met. Even if everything fails, only the National Assembly specifically the House of Representatives can have the mandate over any state and not the President imposing an emergency rule. The beauty of democracy is the ability of the citizens to be able to control the government in power though in Africa it is the reverse. In Nigeria, the Indigenous People of Biafra are continually meted with violence and death simply because they clamor for the right to Self-determination as enshrined in the United Nations Charter. International human right watchdog, Amnesty International has indicted the Nigeria security forces for forceful abduction, violence and death against defenseless Biafrans. The boycott of elections by the people of Biafra shall reveal the distrust between the people and the politicians. The politicians whom are supposed to represent the interest of the people who voted them into power will instead carry on with their personal interest and ambition to the detriment of the people. The conspiratory silence of the political class of Biafra origin against the continual injustice carried out against their constituents is at an alarming rate and the people have had enough. It is true that the religious and traditional leaders in Anambra state have been mobilized to propagate against the planned election boycott and that should be another more reason the people must be determine to go ahead with the civil disobedience of boycotting the election. The proposed imposition of martial rule in Anambra state because of election boycott should not in any way frighten the people of Biafra for they have gotten worst. The wanton killings of innocent and defenseless Biafrans seeking the right to Self-determination took place while a civilian governor was in charge of the state, so why the fear for the imposition of an emergency rule? The boycott of elections in Biafra land will be a huge step towards the restoration of Biafra and must be encouraged. Though, the uncivilized government of Nigeria will prefer violence to a peaceful resolution but the people of Biafra must go on with the boycott of elections and adjust their mindsets for what is to come because Biafra must be restored in whatever form with the option of diplomacy or warfare.